A frequent problem now is that people are ABSOLUTELY PIG IGNORANT a lot of the time on political topics. I'm not just talking about the person in the street, I'm talking about POLITICIANS as well. From the Louisiana State Rep. who not only thought that 'religious' meant 'Christian' (as in redneck, bible belt, sod-thy-neighbor Christianity) and not Muslim, but that the Founding Fathers of the US were Christian (they weren't, they were mainly Deist); to the former Governor of Alaska not knowing what CENTURY the US Pledge of Allegiance was written in (for reference, it was written in 1892 and not adopted as the formal pledge until 1942). The problem is, clueless politicians like these (who likely wouldn't pass a US Citizenship test) only have a chance of being elected, if the populace is even more clueless. A major reason is the lack of requirement for news to be factually based. But increasingly it's also because of social media. 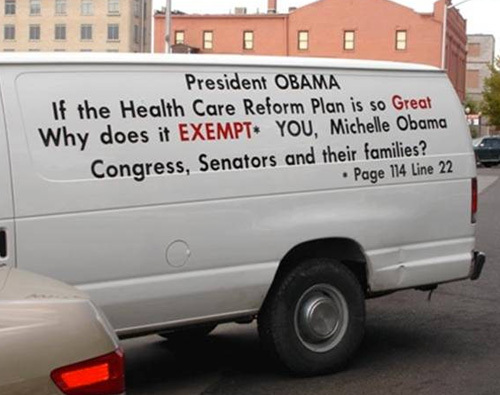 Take this image that did the rounds again on Facebook following the Supreme Court decision to uphold the Affordable Healthcare Act. 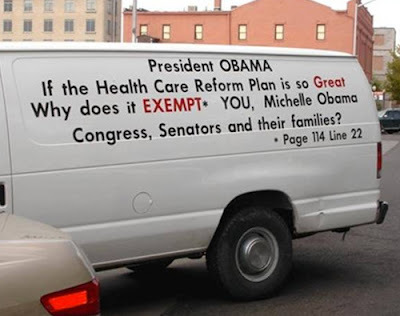 Although, the text on this truck is not exactly what is happening, it has been seen on the streets in America -- below, I share an article from Forbes debunking the "exempt" status of our Reps, and meanwhile, the People are speaking, and it is going to get A LOT LOUDER -- are YOU ready, Patriots?? "SHARE" this posting to inspire your camp. It was shared over 42,000 times, with 5100+ 'likes', just on that one instance, there are undoubtedly more. And what an example they are. 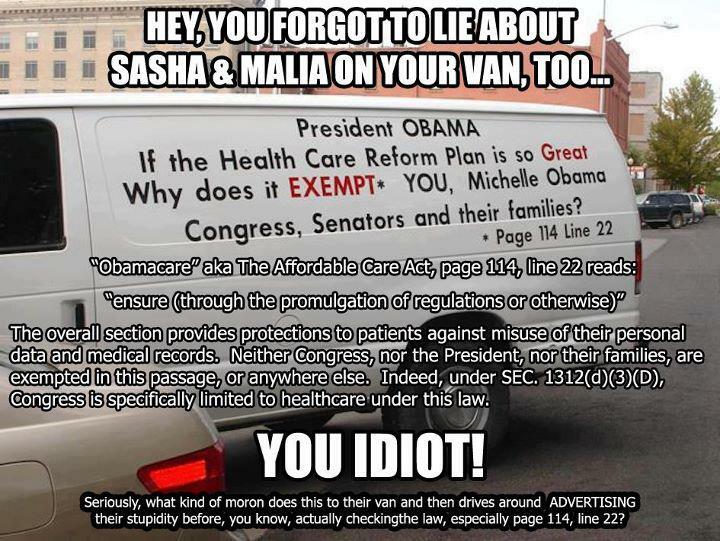 "we know it's not true, but we're going to post it anyway because it fits our message'. Of course many comments also pointed out the lie, but people don't tend to read the photo's comments, they read the comments of their friends when they share it. Taken from Being Liberal page. Used under Fair Use for Critique. This post wasn't spread so widely (4928 likes, but only 2912 shares at present), perhaps because it doesn't stir the anger as the original picture did. It's more of a humor thing, and humor is a more subjective thing. We can all get angry about a perceived injustice, and share it to help 'inform' our friends. Yet the correction image is more difficult in a social situation. If friends and/or family had earlier shared the first picture, and voiced agreement, many will not share this corrected one, for fear of upsetting, insulting or demeaning them. It's the problem that has plagued those who have been deluged with chain emails, never-ending forwards, and even Nigerian scams. The ego has become more important than teaching facts. It's a problem that's not just confined to the ideological Right (although strictly speaking, what is termed 'the left' in the US is still objectively right-wing). but also rears it's head in the 'liberal' groups as well. 24 hours ago, the following image was posted to the page "1,000,000 Strong to Help Improve Tea Party Patriots' Spelling and Grammar"
There's problems with that, massive problems as the figures are WAY off. I was not shy to point it out. To their credit, the page admin (who also apparantly lives in Georgia) asked me if I'd make a corrected one. And so I did. However, they didn't take the above picture down. At this moment, it's got 241 'likes' and 305 shares, and a LOT of comments about it being wrong. Here's the corrected version I created. There was an image doing the rounds with figures for this in the millions. The reality isn't THAT bad, but I've corrected the figures and added a little more information. It still shows that the program is a net-loss (except for the few, like the Florida Governor, with a financial interest in a drug testing company) and that people applying for Federal Assistance are less likely to be on drugs than regular citizens. FULL DISCLOSURE I actually made an error in the image first time around. It was only when I was writing this piece about it that I noticed I'd said 98% passed. In reality 98% did not fail, 97% passed. Apart from myself, no-one's shared it (yet) but again, it's the problem of ego, of not wanting to upset or anger people by pointing out that things they believe are wrong. It's why the quality of discussion is forever spiraling into the drain. People are afraid to be wrong. Tactical voting exists because people are afraid they won't have voted for the winner (or a close runner up). It's why 'mediums' and psychics exist and flourish (despite being Bullsh*t), and why people still turn to watercures, or homeopathy and believe in Astrology (again, all bullsh*t) and why Creationism has been a hotly contested topic over the last 15 years in school districts across the US - despite there being zero evidence to support a creationist argument. 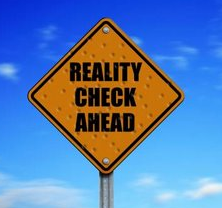 As a nation, is the ego so fragile, withered, and feeble that it can't withstand critical examination. And why have beliefs been permitted to foster, and even be encouraged, even when they are naught but lies. It's perhaps why people talk in vague abstractions, when dealing with the country, because the reality and the specifics, as illustrated in this TV clip, are hard for people to swallow. It's long been said that it takes a big man to admit when they're wrong, and an even bigger one to do something about it. It's time America showed how big it is.